We choose this tour mainly because this package did not include Jeju Island. We wanted to do Jeju Island on our own next time. Not this time. This was my second time to Korea, my first was almost 10 years back and it was a free and easy in Seoul area only. 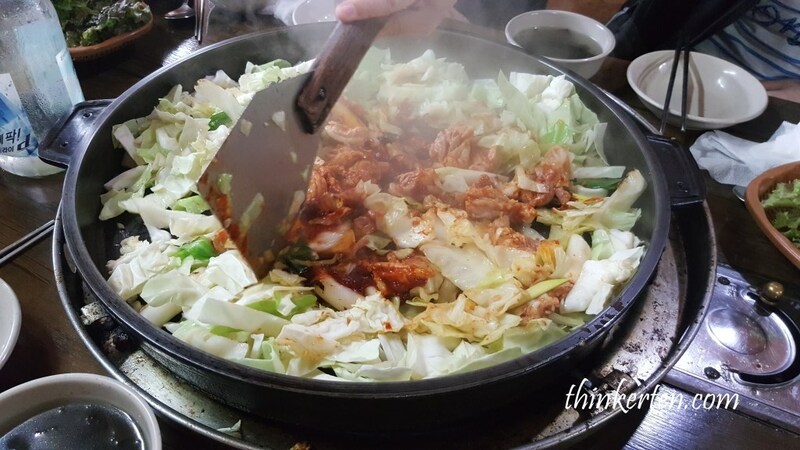 What impressed me most from my first time Korea trip was the yummy food. Portion was always very big no wonder most Korean are so tall and big. We arrived at the Incheon Airport early in the morning before 8am. We had our breakfast, Korean porridge at the airport and then headed to Nami Island. I slept through the whole trip in the bus because I did not have a good night sleep in the plane last night. We were here in the early winter so there were some fake snowmen decorated at the entrance but there were no real snow. We reached the island at around 10am and it was already flooded with tourist from Asia. starring Bae Yong-joon, the Mr Spectacle guy and Choi Ji-woo. As a result, it attracted millions of visitors, especially from south east Asia to visit this spot and to experience the romantic moment along this path. The weather was freezing cold even though there was no snow. 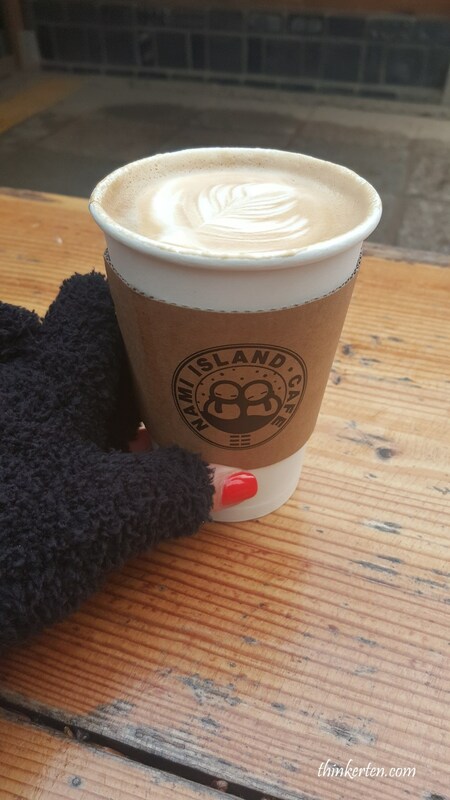 We had some coffee and tea in the island to warm up our body. The price of the coffee and tea were about the same as the price in Starbucks Coffee. Because the main Metasequoia path was so crowded with tourists, I took some pictures at the other small path which has less tourists. The main Metasequoia definitely look more beautiful and it would be better if there were thick snow. Many stalls were opened for snacks and souvenirs. We bought a hot corn but not tasted good at all. There were also museum, handicraft studio, Glass Workshop around in the island. If more time were given, I don’t mind to explore the handicraft studio and museum. 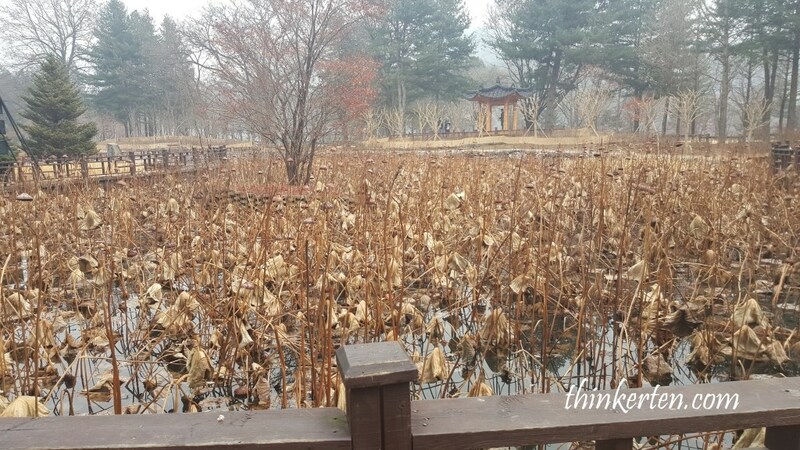 Nami Island is a great place to escape and it would be better if we were staying overnight in this island, then we could explore the train ride and lake view more. I heard this island is a ghost town in the evening when all tourists left. A perfect time to have some peace and quiet time! 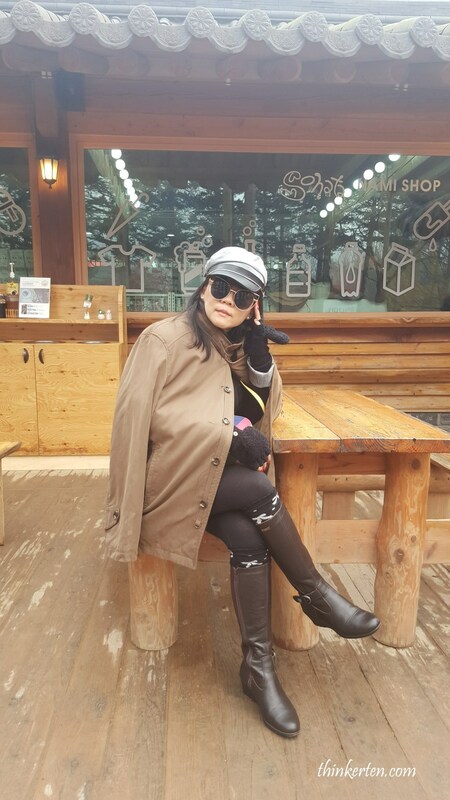 The colours of Nami Island during early winter/late autumn was quite awesome, the color was pretty much like my jacket, brown! 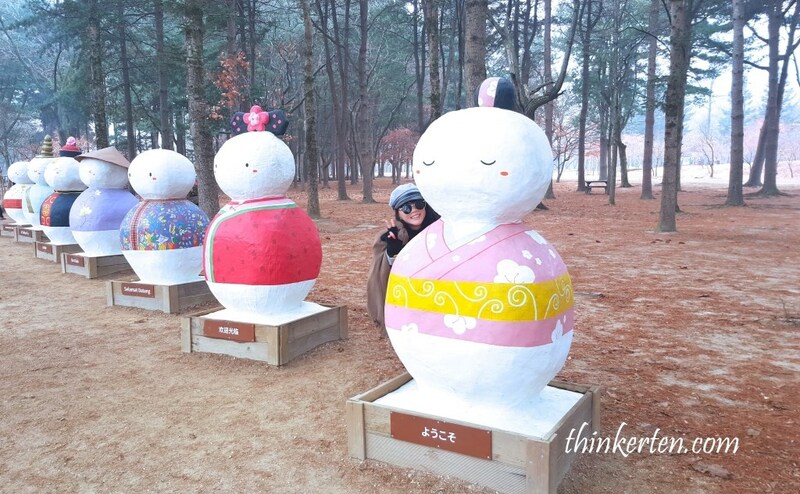 In December 2010 Naminara Republic, Nami Island was designated a UNICEF Child Friendly Park. 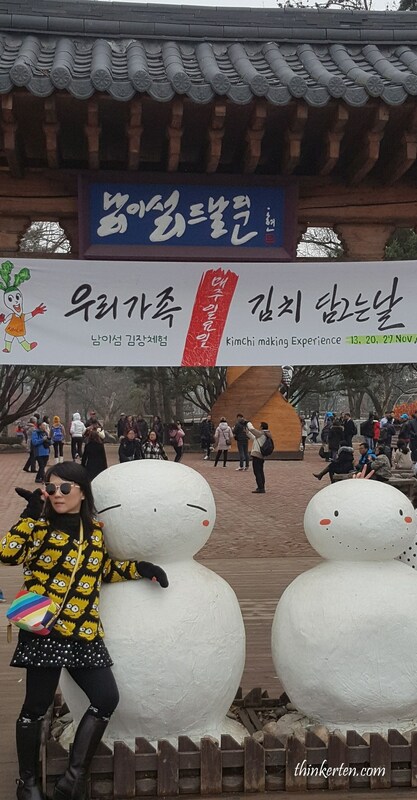 This was a first for Korea and only the 14th park in the world to receive such a designation. 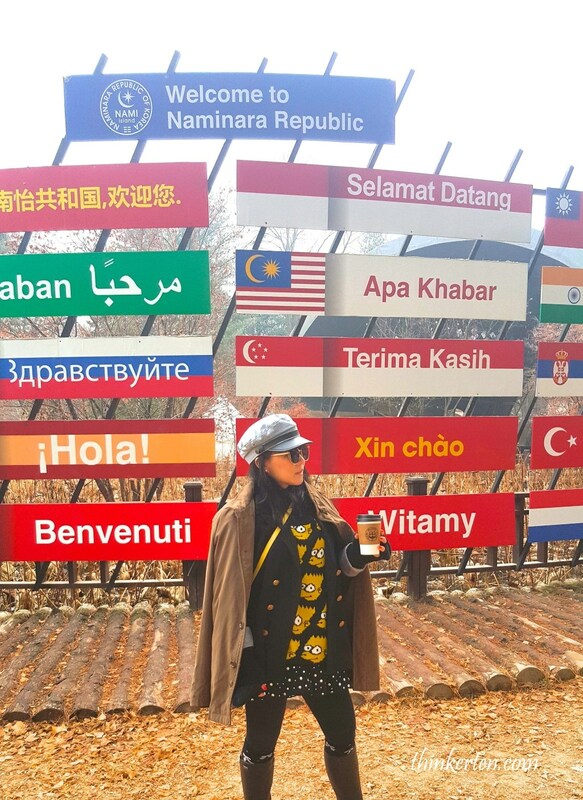 Nami island is a micronation – independent nation but not recognized by world governments and there is a “visa” and has its own passport, currency and stamps. 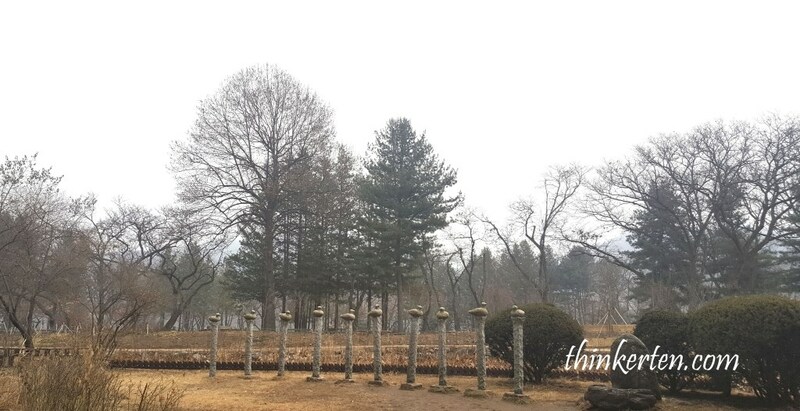 A very special features I noticed in Nami Island is there is no telephone poles and all the electric wire were built underground to keep the landscape in a natural feeling. Our tour guide only given us 1 hour to explore this place so we could not rent a bicycle. Now thinking back, it was not wise to rent a bicycle also because most of the main spots were quite crowded with tourist. Furthermore renting a electronic bicycle doesn’t cost cheap also, 10,000 won for just 30 mins! 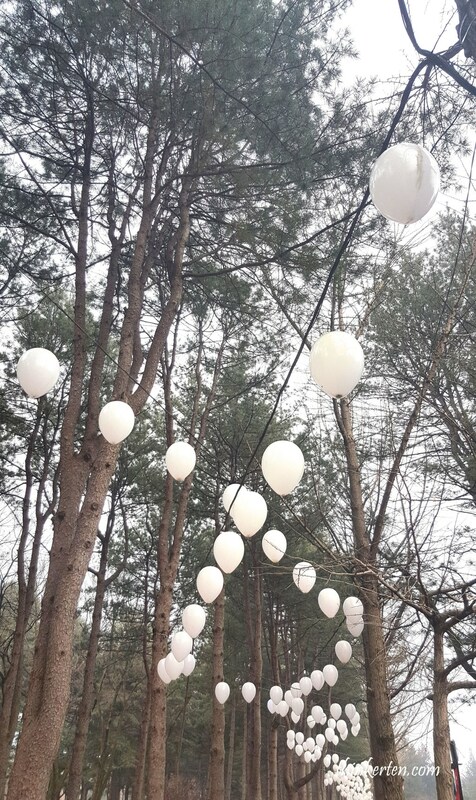 I think there should be some light up at nights with these beautiful light bulbs hanging on top of the tress. 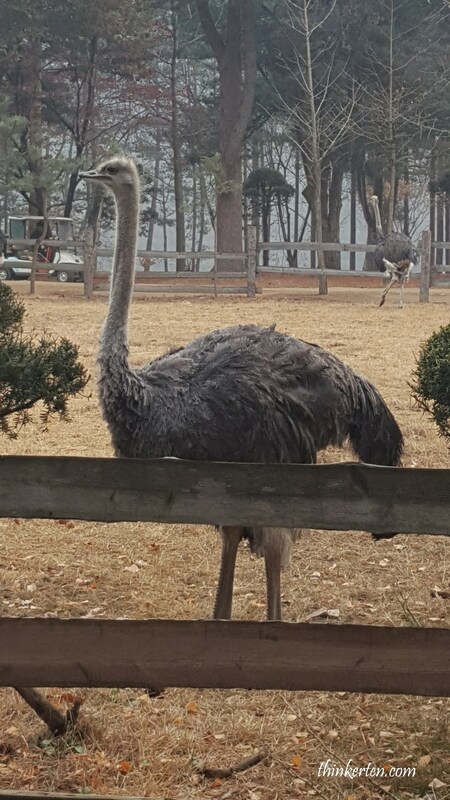 This place is also filled with many small animals such as squirrels, birds, fishes and I found few ostriches in this little ostriches farm. When I looked closely, the ostrich’s head and bill are quite small for it’s huge size. Cute if you look closer! 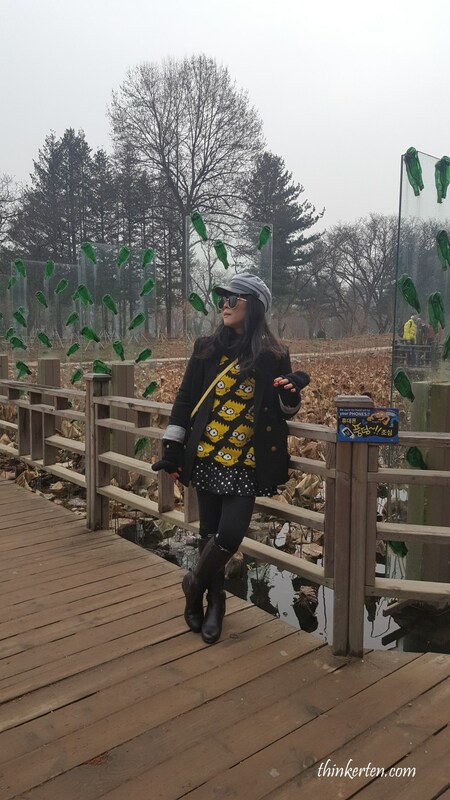 We left Nami Island at around noon time and headed for Korean Pan-fried Chicken for lunch. It was pan-fried with chicken and lots of cabbage on the bottom. The chicken was marinated with some chili paste. It was nice to eat hot pan-fried chicken in the cold weather. 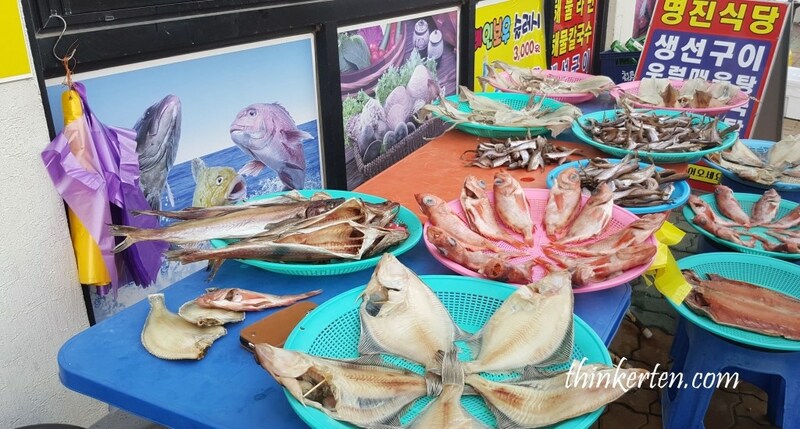 After our lunch we moved to Daepohang Port Fish Market. It was freezing cold when we arrived at the Daepohang Port, probably due the the water behind me. 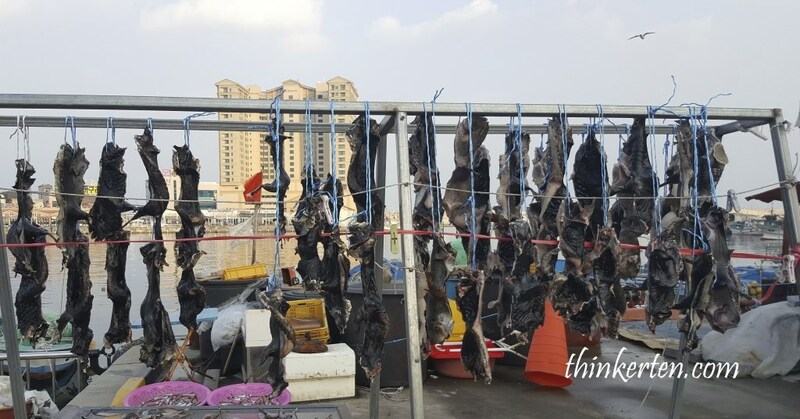 Once I walked towards the fish markets, there is a narrow roads hanging all the dried seafood for sales. It was about 3 pm in the afternoon when we arrived at Daepohang Port. I did not see many locals at this timing probably because locals normally do their wet market shopping early in the morning. 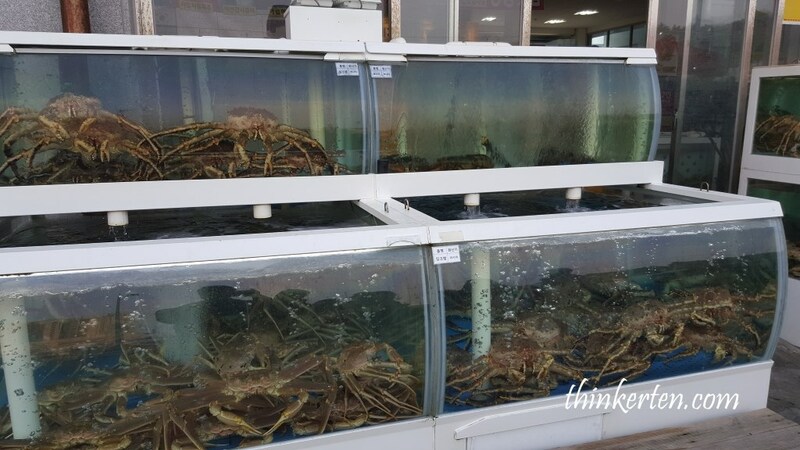 However I saw many tourists tasting the fresh seafood. Plenty of fresh fishes put on the floor for sales. The port is filled with raw fish restaurants and a live fish market containing all type of fishes, clams, mussels, crabs, eels, squids and many others kind of fishes which I don’t know their name. 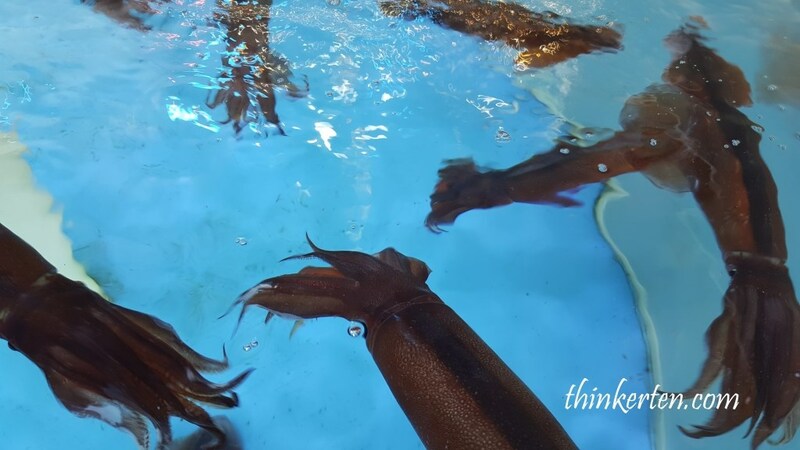 Some of our tour members were having the sashimi/raw squids and crabs in the restaurants. We stopped at one of the food stall in the market, not really a restaurant but they did provide us seats and we ordered some seafood and asked them to barbecue for us. We were given a giant mussel, 3 big clams, 3 big oysters, few shishamo/(willow leaf fish- small fish with lots of eggs in the stomach) and many small pippies/”lala”. The seafood we ordered tasted very delicious after the barbecue mainly because it was so fresh and the price was very reasonable too. If I remembered correctly, it was only 35,000 won. I like how the giant mussel was being cooked with cheese and their local chili paste. It tasted awesome. 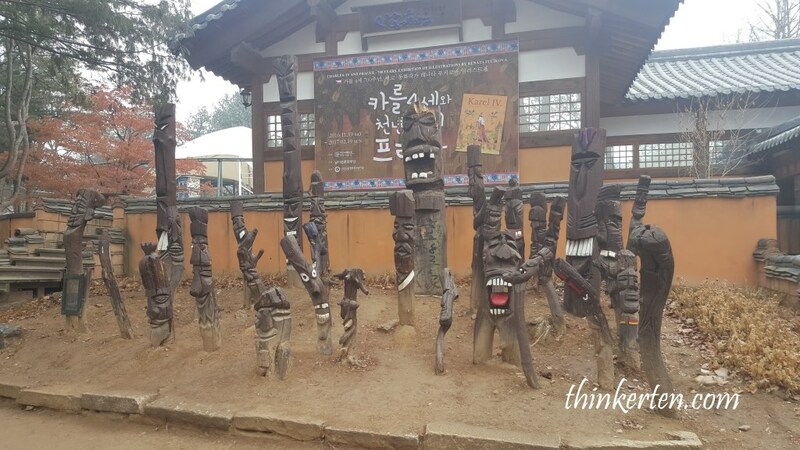 We were staying in Delpino Golf & Resort (Sorak Daemyung Resort) for 2 nights. One thing I love about Korean hotel was the wooden floor was warm in the hotel room and so we could not feel that cold even though it was winter. We were gathered at around 6 pm and headed for our dinner outside the hotel. The menu was the Saba Barbecue fish. 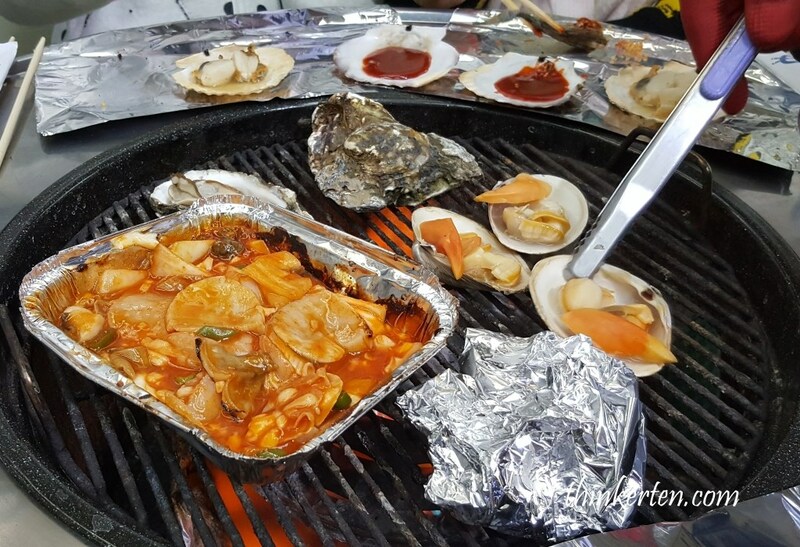 I could not finish the whole Saba fish because we had some seafood barbecue at Daepohang Port Fish marke earlier. However I was very glad some Korean side dishes were given and all tasted quite yummy and appetizing. 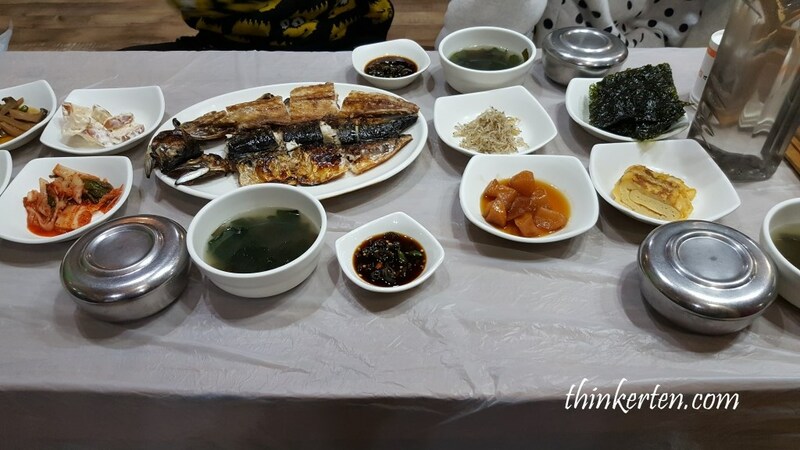 It was funny that I could not finish the main course which was the Saba fish but able to eat a lot of their side dishes and asked for free top up.